Before you read any further, I want you to know there is NO single workout plan that will give you significant results forever. Why? Because your body adapts as it gets stronger, loses fat, and becomes more fit. A good workout plan will anticipate plateaus, and provide you tools to restructure your routine to get the fat loss (or muscle building) results you desire. There are many sites on the Internet that promise quick weight loss results, or programs to build bigger muscles "in half the time," but all they will do is take your money. You want a solid workout plan that you can integrate to provide a more positive lifestyle so that you are maintaining your results 10 years down the road. The best workout program for you will attack your fitness goals from three specific areas: (1) diet (2) strength building, and (3) intelligent cardio. It doesn't matter if you want to lose weight or increase muscle size, a quality workout plan will utilize those three elements to help you reach your goals. * It is pretty safe to assume most women want to lose belly fat, lose thigh fat, get rid of cellulite, and look more toned. * Guys definitely want to get rid of male belly fat since it is such a turn-off to women. They also want more muscular size and abdominal definition. * These are two different fitness goals, yet they will be controlled by the same three elements. * The best workout program for you will center on top-level, natural nutrition. (NOT expensive and worthless supplements.) The more you learn to make good food choices, the faster you will see results. * Increasing strength comes from resistance exercise (and cardio interval training.) You can start with body-weight movements...but to really see results, you must add weight training to your program. * There is no reason for mindless hours of cardio. Once you become strong enough, you must introduce interval workouts into your routine. This is how everyone from Olympic athletes, to professional athletes train. The promise of quick weight loss or putting on slabs of dense muscle mass are enticing, but they are not reality. When you see someone with the build you desire, you can bet they have put some time and effort into their training. Yes, some are genetically blessed with freaky DNA...but most have put in the hard work. * Women can reach their fat loss goals with a strong commitment to conscious eating and learning what foods sabotage you. * Men can build bigger muscles and get the lean Hollywood look that women find so appealing with the same commitment. * The best workout plan will recognize diet is the #1 key component of your exercise goals. * Fundamental strength building exercises in the weight room are the key to building lean muscle that naturally increases your metabolism. * Since women have such low levels of testosterone, they will become more toned and fit-looking with a quality workout plan. Men will see an increase in muscular size and definition. * The best workout plan will constantly evolve as you grow both stronger and older. Variables such as workout frequency and workout intensity will be significant to your lifelong progress. A proven program that has gotten measurable results is the best source for creating a sustainable workout plan. The Truth About Six Pack Abs is NOT just a program crammed with ab exercises. Author, Mike Geary, takes a much more comprehensive approach. * It focuses on eliminating body fat, while building lean muscle. * Mike centers his program of knowing EXACTLY what you are putting in your mouth each time you eat, and how it affects building lean muscle...or heading right to the mound of fat deposits. * His program centers on strength training and how it effects your overall weight loss, lean muscle gains, and appearance. * It has eight levels of total body exercises and eight levels of ab training. * His best-selling eBook can be downloaded immediately and carries a 60-day 100% full refund. 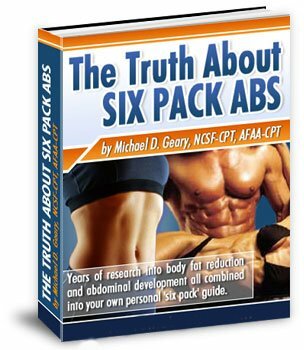 The Truth About Six Pack Abs is the best workout plan we have found. It is sensible, educational, and effective. Mike Geary has helped 1000's of men and women achieve the bodies they desire.